I got suckered into buying Dragon Bound by one of the best book pimps around-Bells from Hanging With Bells and then was lured into reading it by Danielle from Lush Reviews. I couldn't handle her omg tweets any longer and had to see what all the fuss about this book was about. I was totally enthralled by the story and literally could not put it down. Naps were forgotten, and lunch was burned while reading. Let me just say this book is worth all the hype and gushing it has gotten from everyone. Once in a while a book comes around where you totally fall in love with all of the characters. 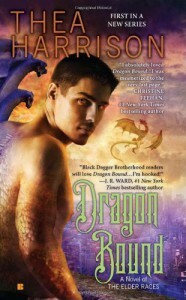 Dragon Bound was one of those books. It's hard to say what makes this book so unforgettable and swoon-worthy. There's just something magical about it that is hard to put into words. Thea Harrison has constructed a world in which I completely felt at home in, and wanted more of-like yesterday. The heroine Pia, is great-not just because she has great comeback lines and while she might just a little afraid of Dragos, the hero she doesn't let him see her fear. I liked her because she let us see who she is vulnerabilities and and all. Dragos is just :sigh: so alpha male. He wants to be in control all of the time, and didn't like that some tiny bit of a girl was able to wrest some of it away from him. The secondary characters are just well, great. Rune, Grayson (who was my favorite) and Tiago are apart of Dragos' guard, and I can't wait to have their stories-like yesterday. Tricks becomes friends with Pia and is Dragos' PR person and she had me lol'ing a lot. I am so happy to have her story next. The world and character building just flow so nicely together that it makes it impossible to put the book down. I loved how there were shape shifters of every kind and just when you thought you knew what was happening, you didn't. Some of it was predictable, but the characters are so lovable it's forgiven. I bought this book on my Kindle and this is the first book that I've wanted to own in paperback as well as having it on Martini. It's hard to say really what makes this book so different then other paranormal romance books out there, but it just is. Barrons Hero Hotness Meter: :sigh: So darn high.